01:00 – GR always saw herself as an athlete, primarily, but loves to be seen as a coach as well. 01:30 – Played in grade 10 at St. Pat’s High School, coached at many levels for over 40 years. 02:30 – Loves practices with girls’ teams – prefers them to the pressure of games. 03:00 – GR always coached girls, never boys. Girls and boys are coached differently, and male and female sports are fundamentally different. 04:50 – Played basketball originally because there were few options in middle school. Basketball became thrilling to GR and her love for it never went away. 07:00 – GR broadcasted first at the UNB radio station on Friday nights, preparing students at the university for partying with party music. She loved radio and tried to stay in the field, but women weren’t welcome in radio beyond the university community. While attending university in Montreal, GR was rejected from working at a radio station because of her gender. 09:45 – Bruce and GR look at pictures and discuss GR’s long coaching career. 12:45 – GR becomes the first female radio sports director in Canada. It started when GR would call into a radio show to argue about the Nova Scotia Voyageurs, and she was invited to host Sunday night games much to the disagreement of the audience, although other hosts defended her. 14:00 – GR never wanted to do dressing room interviews, as she believed the dressing room was for the team only. Instead, she would interview hockey players at the Forum in the penalty box. At the Canada Cup, there was no time to set up alternate interviews with hockey players, but female reporters were barred from the dressing room by some of the hockey team’s wives. Robin Herman from the New York Times went in anyway, and GR followed after some debate. 16:30 – In her career, GR was star struck when she met Jean Belliveau at the Canada Cup. She also has fond memories of interviewing Guy LaFleur and Bobby Hull. 18:15 – Sports coverage today is improving, but still doesn’t have enough coverage of women’s sport. GR theorizes that the media is responding to the desire of the viewer, but the viewer hasn’t seen enough women’s coverage to know if they like it or not. GR believes that if female athletes are given more profile, the viewers will demand more. 21:30 – GR rejects unfair criticisms of women’s basketball – women can dunk and games are just as exciting as NBA games if not more. 22:30 – Women also need better representation on the production side of media – female editors, directors and producers will make all the difference. 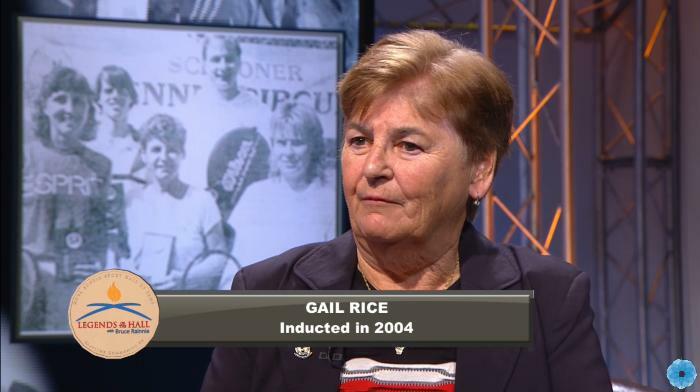 24:00 – Concluding statements, Bruce Rainnie thanks Gail Rice and ends the program.